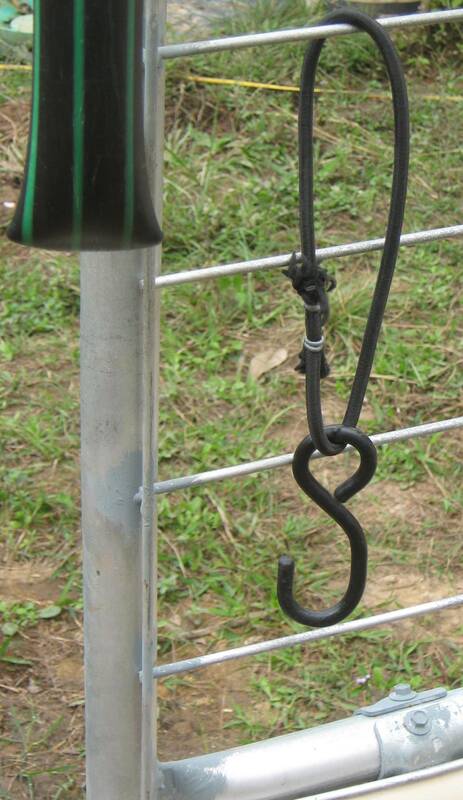 Gate Holding Strap, efficiently holds gate closed or open. This is made from old ‘tie-down’ hook, with stretchy elastic loop (cheap from hardware store), joined by using fencing ring clamp tool, clamping with double rings. These two gate ideas have been proven and tested in our garden for a couple of years now, and the handle and strap have not deteriorated at all, they still work exactly as intended. Categories: Fencing, Handy Hints & Good Ideas | Permalink.